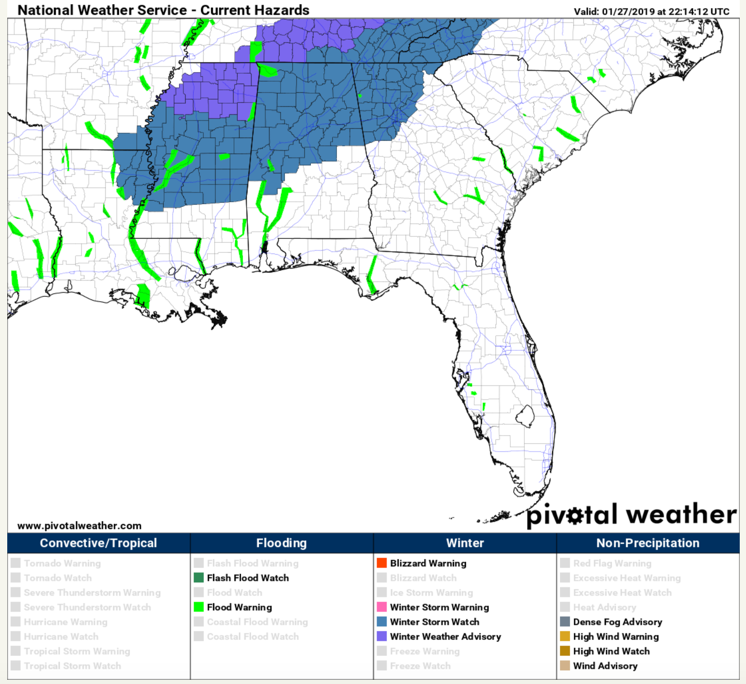 The NWS in Jackson has now issued a winter storm watch for much of North Central and Northwest Mississippi, northeastern Louisiana and southeastern Arkansas. 2-3 inches of snow is expected with locally higher amounts for places like Greenwood, Greenville, Columbus, Ackerman, Starkville, Yazoo City, Jackson and Meridian. The NWS in Birmingham has now issued a winter storm watch from late Monday night through noon Tuesday. It includes the following counties: Bibb, Blount, Calhoun, Cherokee, Chilton, Clay, Cleburne, Coosa, Etowah, Fayette, Greene, Hale, Jefferson, Lamar, Marengo, Marion, Perry, Pickens, Randolph, Shelby, St. Clair, Sumter, Talladega, Tuscaloosa, Walker, and Winston. …and the following cities Birmingham, Hamilton, Jasper, Gadsden, Anniston, Talladega, Columbiana, Clanton, Centreville, Pell City and Rockford. The NWS in Huntsville has also issued a winter storm watch has been issued for their nine counties in the Tennessee Valley of North Alabama and southern Tennessee, including the Quad Cities, Huntsville/Decatur, and Cullman in Alabama, and Lynchburg and Fayetteville in Tennessee It goes from midnight Monday night until noon Tuesday. 1-3 inches of snow will fall across North Alabama. …NWS ATLANTA: A winter storm watch has been issued for areas along and north of a line from Franklin to Jonesboro to Gainesville in North Georgia for up to two inches of snow. Higher elevations of Northeast Georgia may see higher amounts. …NWS NASHVILLE: A winter weather advisory has been issued for all of Middle Tennessee for 1-3 inches of snow. It goes into effect Monday night at midnight. It includes cities like Nashville, Cookeville, Lebanon, Columbia, Shelbyville, Tullahoma, and Lawrenceburg. …NWS MORRISTOWN: A winter storm watch has been issued for their counties in eastern Tennessee, southwestern Virginia, and southwestern North Carolina, including the Tri-Cities, Oak Ridge, Morristown, Knoxville, Chattanooga, Gatlinburg, and Sevierville. These areas would see 204 inches of snow with locally higher amounts of 5 inches in the higher elevations. We will update this post as watches are updated. Everyone in Central and North Alabama should plan for hazardous driving conditions Tuesday into Wednesday as an arctic front brings snow to the South.